The ultimate goal of every young physician while in medical school and residency should be to become a remarkable doctor. However, what if one of the biggest factors of being a great doctor was not addressed from the start? Financial wellness may not directly correlate with being an incredible doctor, but stress can and does, and today's young medical professionals have a lot on their plates — beginning with $200,000 in student debt. Factor in starting a family, buying a home and — oh, yeah — you also have to be a great doctor and work 80 hours a week. When I first started working with medical residents, I was somewhat shocked to hear that their medical schools and residency programs did not provide any financial courses. However, we still get the feedback that their programs fail to provide enough, if any, guidance on everyday finances. Young physicians are not worried about funding their retirement . Their No. 1 concern, and by a large margin, is student loans — followed by day-to-day cash flow, investing, buying a home, insurance items and paying off other debts. I can't help but think back to my own undergrad days and those "required" general education courses. While I loved learning about the history of classical music and the formation of rocks, I can't recall much of what I learned. Most of you probably face the same dilemma, because it wasn't practical for us at that time. We did it because we had to. However, there is a form of education today labeled just-in-time training. Just-in-time training is meant to provide education on topics with maximal application and practicality. Why doesn't medical school require a general education course in the fourth year on student loan repayment? Why doesn't the hospital offer a cash-flow and budgeting course to its first-year residents? This is another example of how the education system still fails to teach us about general finances and misses an ideal opportunity for just-in-time education. You don't need to be a doctor to understand that stress is not a good thing and it does take a toll on us. In fact, a recent study found that 45 percent of employees say financial matters cause them the most stress in their lives. Additionally, 23 percent of those employees say it affects their relationships at home, and 17 percent say it affects their productivity at work. Take those numbers and then factor in that residents are enduring 80-hour work weeks at a hospital, which equates to functioning more than 11 hours per day, seven days per week. Many advisors disregard young doctors because they have a negative net worth. That's sad, because early in their careers is when many physicians need professional guidance the most. Even when new physicians do find financial advisors, the advisors are often more worried about selling them something than crafting plans that address their real needs. Even worse, countless advisors still give the cookie-cutter student loan advice of "pay the highest-rate loans first." While that may be the best approach for some borrowers, advisors are failing to provide guidance on income-based repayment plans and public-service loan-forgiveness options. 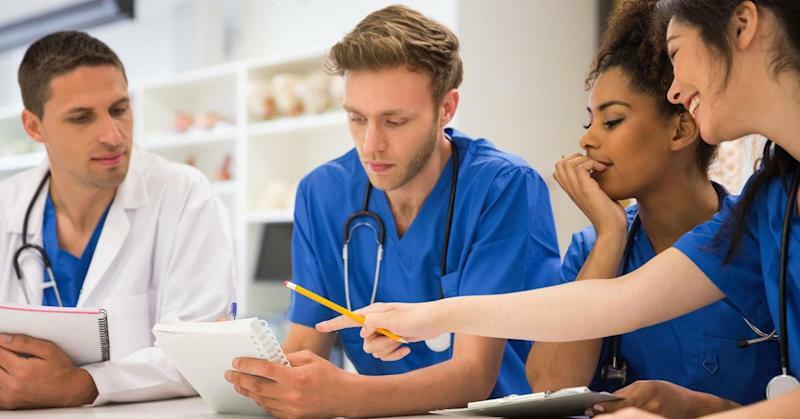 Even when young medical professionals think they have their loans organized, only about half of them feel they are on the proper path to loan payoff or loan forgiveness. Financial literacy is a problem in this country, and even though medical professionals are brilliant, many have not had time to learn about everyday finances. In a perfect world, fourth-year medical students would be required to take a course on student debt repayment. The class would walk them through the different income-based repayment plans, public-service loan forgiveness, federal loans vs. private loans, and other loan issues. In residency, you would have another required class on general financial wellness. You would tailor the course around budgeting, investing, risk management, credit cards, home and car loans and emergency funds. Would I expect physicians to become do-it-yourself financial planners? No, but we could at least support them with proper tools and provide a blueprint. The majority of the doctors we spoke with do not plan to hire a financial advisor until they are an attending physician. That leaves three to seven years, depending on their specialty and fellowship, for things to go wrong before they hire an advisor — the biggest concern being student loans. That's because, if you miss those vital three to seven years of income-based repayments for public-service loan forgiveness, it may be difficult to recover. Dr. Atul Gawande, surgeon and writer, said, "No one teaches you how to think about money in medical school or residency. Yet from the moment you start practicing, you must think about it." It is time to start teaching financial literacy to young physicians — not so they can be day traders, but to allow them to be better doctors, which benefits us all. Should you retire with a mortgage or pay it off?